The hero, Rajneesh Duggal tries hard to match her histrionics but stays largely stiff. Even in moments of high melodrama, in which he rages against his fate without blinking once, he remains oddly wooden. Actually, the real hero of this film is the house. The thoroughly spooky scenes are few and far, but they’ll get you while they’re at it. Vikram Bhatt visits the horror genre again, after Raaz. 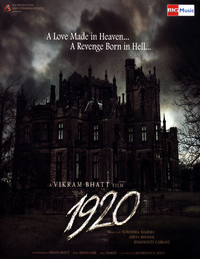 Also, like Raaz, 1920 talks of love, lust and paranormal forces. It's a peculiar attempt, this 1920.